Don't buy a carrot cake from the store—make a delicious one right in your own kitchen with your own two hands. A homemade carrot cake is always more appreciated and enjoyable than a store-bought one. So try this recipe out! This gorgeous carrot cake boasts three layers. 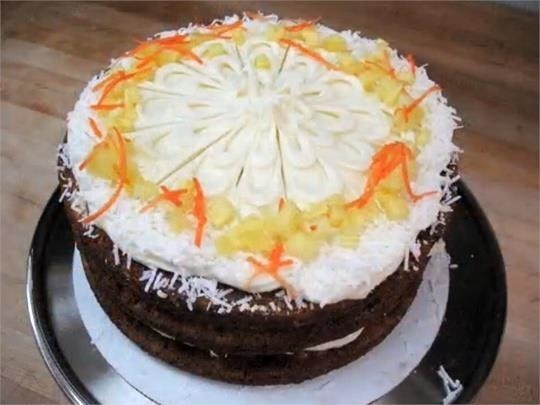 The various textures of shredded carrots, chopped pineapple, and velvety cream cheese frosting combine to make every bite memorable. And wait until you see how it's decorated. A winning technique from Clare Garland of Ashmont Grill. Serves 12-16. This batter is great for cupcakes too! Click through to watch this video recipe from Clare Garland, pastry chef at the Ashmont Grill in Dorchester, MA, on how2heroes.com.